June 13th marked the official groundbreaking date for Echelon Seaport, a 1.33 million-square-foot Seaport District development by Cottonwood Management. Comprising three buildings, two towers of which will comprise condos, this entire project will span more than three and a half acres converging at B Street and Seaport Boulevard. This is another major addition needed in the highly sought after luxury condo market in the Seaport area. With construction slated for completion in 2020, it will be some time before we see the finished product. However, it's on tap to be one of the biggest and best Boston’s Seaport has ever seen. In fact, it's being touted as the largest residential development in the Seaport District, with this block being the largest single amount of for-sale housing within this gorgeous neighborhood. You already know what an amazing place the Seaport neighborhood is. 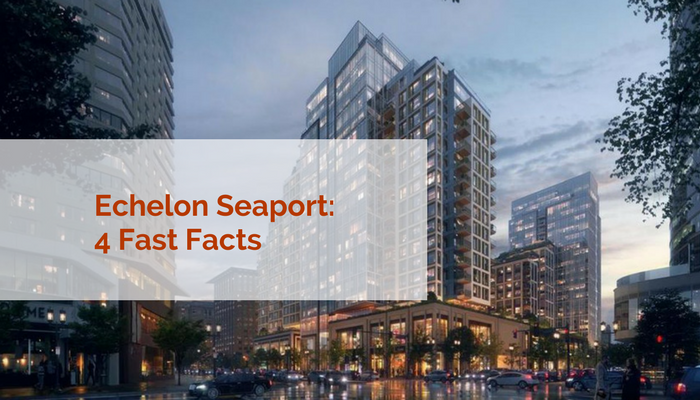 But here are four fast facts about Echelon Seaport , in particular, ou should know about this revolutionary condo offering in the city's most beautiful area. This is a three-building project that will include 733 luxury condos and apartments. Two 21 story towers will be home to 448 luxury condos. The third tower will be home to 285 luxury apartments. The towers will span a total of 1.3 million square feet. The project will include 125,000 square feet of restaurants and boutique retail space on the first two floors. Landscaped outdoor space in the form of a plaza will provide areas of relaxation and entertaining. That plaza is also open to the public. There will also be garage parking to accommodate every resident, totaling several hundred spaces as of now. Sitting in the Seaport's "Block M" development area, Echelon Seaport will comprise nearly four acres of valuable land at the popular B Street and Seaport Boulevard. This area of the city is desirable due to its prime position on the Boston Harbor, just southeast of downtown Boston and north of Southie. Thanks to multiple bridges, public transportation, highways I-93, I-90 and Express to Logan, as well as water taxis to Charlestown, Rowes Wharf, East Boston and Logan airport, residents will have immediate access to the city for work or play. Cottonwood Management, based in Los Angeles, is the developer for Echelon Seaport. Cottonwood broke ground in June and expect completion in 2020. This three-year project will comprise the largest single luxury condo ownership development in the Seaport upon completion. Dubbed the “hottest neighborhood in town” by Boston Magazine in 2012, the Seaport District is certainly grabbing the attention of young professionals and families looking to put down roots close to the charm of the big city. This harbor front neighborhood boasts unparalleled views, eclectic dining, trendy bars, and a sunset skyline to die for. Pre-sales will be starting soon, so get in on the bottom floor while there are still units available. Call Elevated Realty at 617-701-6300 or email us at info@elevatedboston.com to learn more about buying at Echelon Seaport.